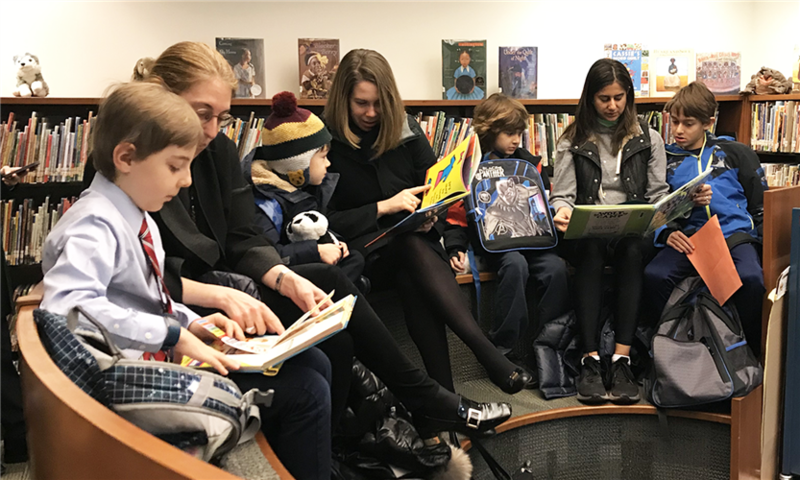 Boys and their parents enjoy quietly reading together before the start of the school day. 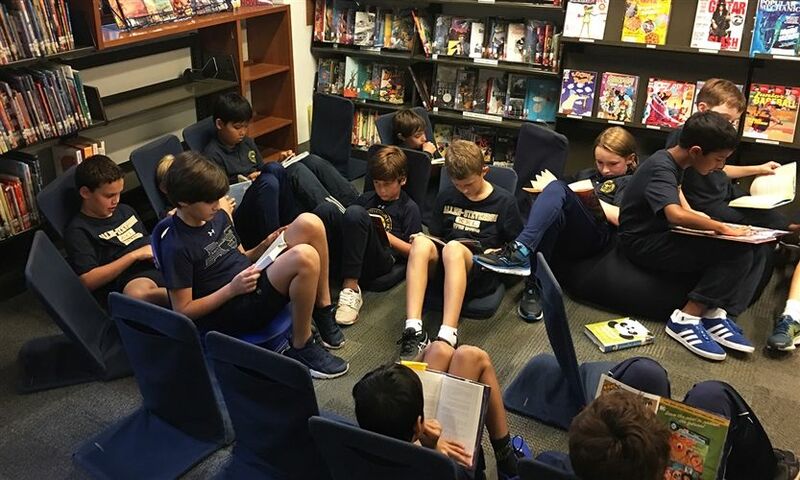 Sixth graders share books in a cozy spot during D.E.A.R. 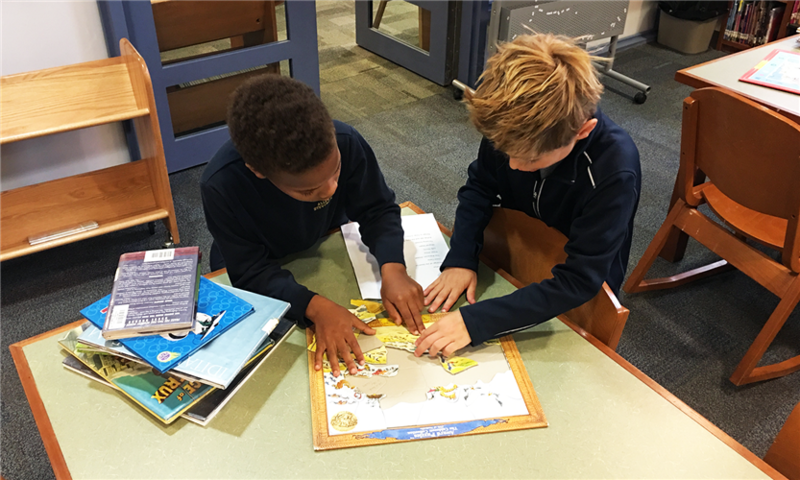 A treasure hunt for puzzle pieces proves to be a fun way to learn where books are located in the library. The Cardboard Kingdom has been a favorite book this school year. Boys love creating their own cardboard creations in Mrs. Kresberg's elective. Many congratulations to these boys whose names were randomly selected in our first Adi's Challenge drawing. Keep on reading boys! First graders are thrilled to show off the books they just borrowed - one fiction and one nonfiction. 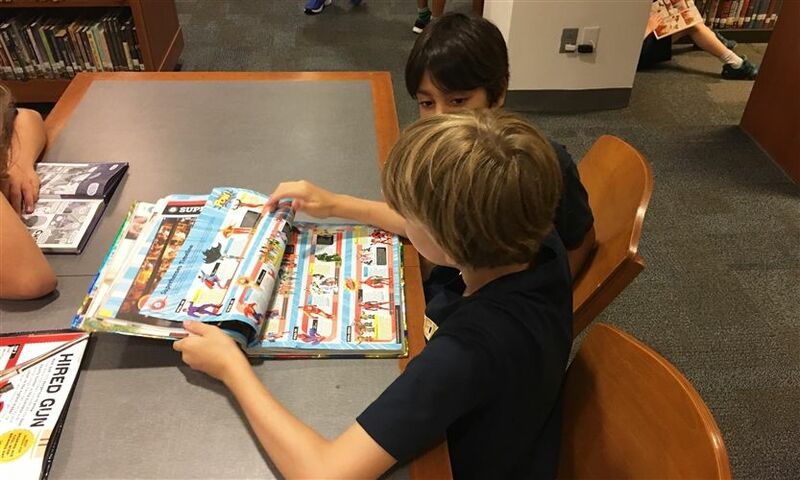 These second graders advise each other as they search for a good book to read. 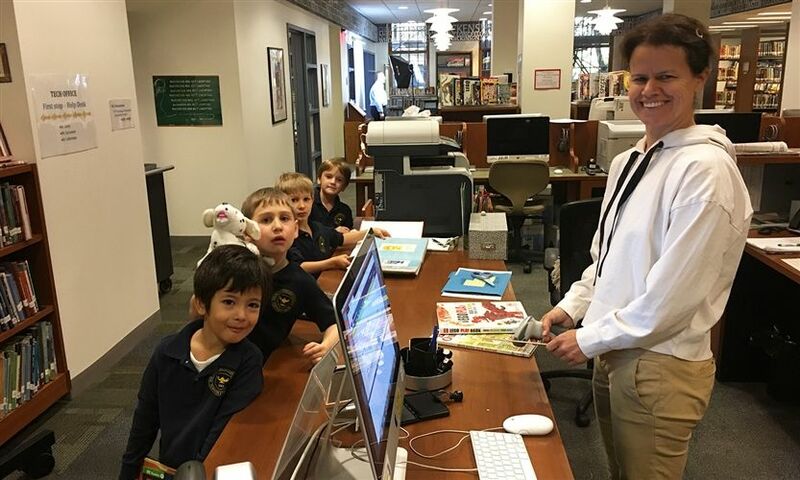 A weekly highlight for these kindergarten boys is checking out books from the library. Fourth graders read together during Drop Everything And Read. 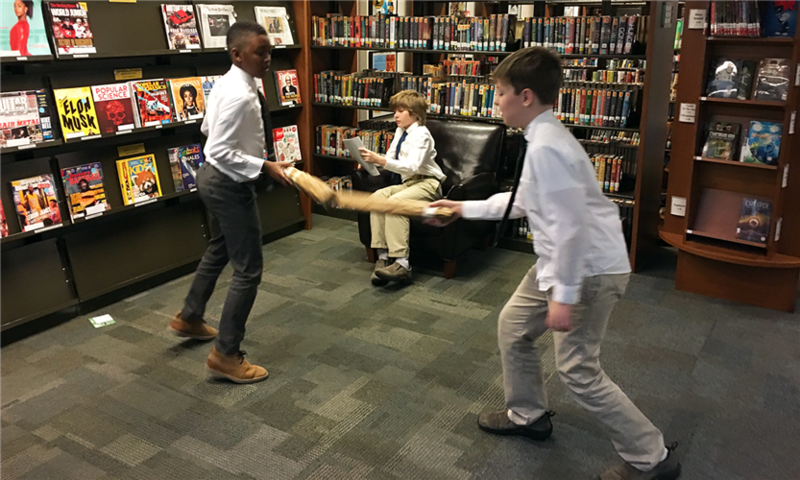 These middle school boys are engrossed in our wide selection of books and magazines. In this colorful and touching story that celebrates what makes each of us unique, a little creature that's not quite a bird and not quite a bunny--it's "neither"--searches for a place to fit in. Jaxon’s mother has to go to court and has no one to leave him with except this strange woman who she calls Ma. Ma is actually not Jaxon’s grandmother, but in facts turns out to be a witch with the job of saving three dragons. Magic, family relationships, and understanding differences are what make this first book in the series a must read. Set on Chicago's South Side, this compelling read follows 13 year old T'Shawn as he discovers a passion for diving and navigates a tense relationship with a brother who has recently returned home. Flying Lessons & Other Stories, edited by Ellen Oh, cofounder of We Need Diverse Books. As the editor of this collection of stories by authors we know and love notes, “our stories are unique, just like we are. And that is what this book is all about—ten diverse stories from ten great authors. For all of us.” These are stories you will enjoy and not forget anytime soon. It may seem early but it is time to choose the book you would like to discuss on your first day back in the middle school in September! Please listen to this Voicethread to learn about the books on offer, and then fill out this form to indicate which three titles you are most excited to discuss. We will do this in library class. Before the book fair we will let you know which of the three books you will be reading and discussing. Calling all middle-school boys and parents. Please join us for breakfast and to share in a lively discussion of Sharon Draper's Out Of My Mind. School Library Journal describes this powerful book as a "gutsy, candid, and compelling story." 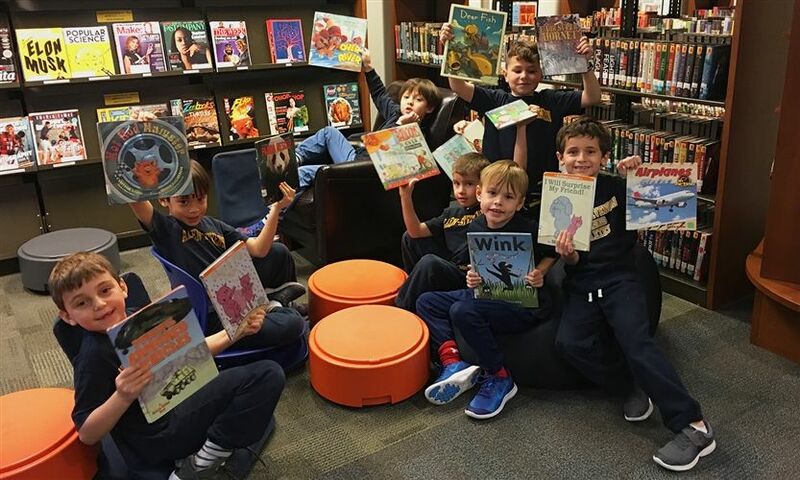 Last week was Book Week at Allen-Stevenson, where the A-S community celebrated books and the joy they bring us. 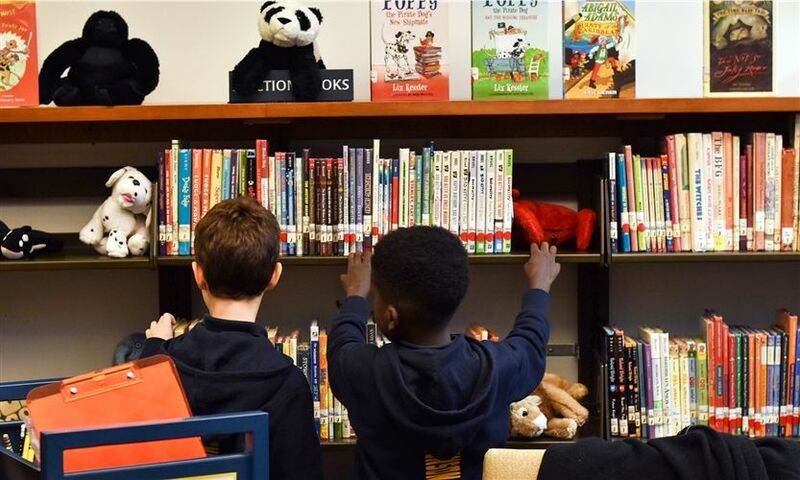 The week was full of book-related trivia, activities and celebrations, all focused on the core idea that the value of reading goes beyond a school assignment, but personal enrichment. The American Library Association announced this year's award winners. 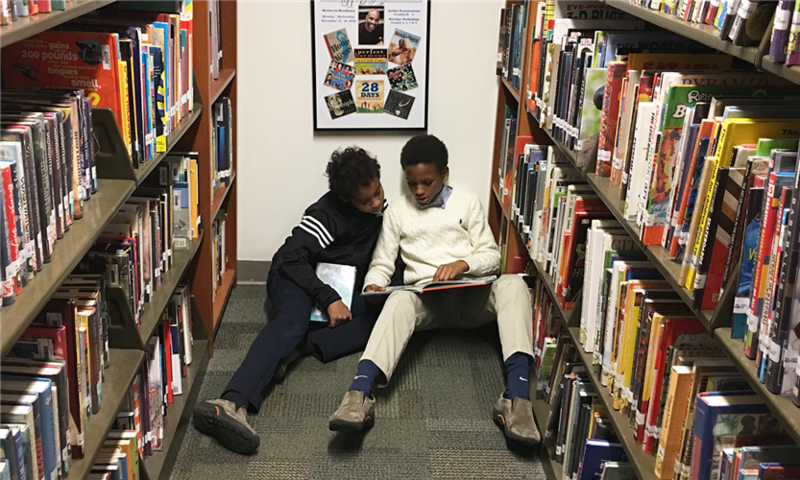 We are thrilled to report that Adi's Reading Challenge included the Newbery Medal winner, Merci Suarez Changes Gears by Meg Medina, as well as the two honor books: The Book of Boy by Catherine Gilbert Murdock and The Night Diary by Veera Hiranandani. 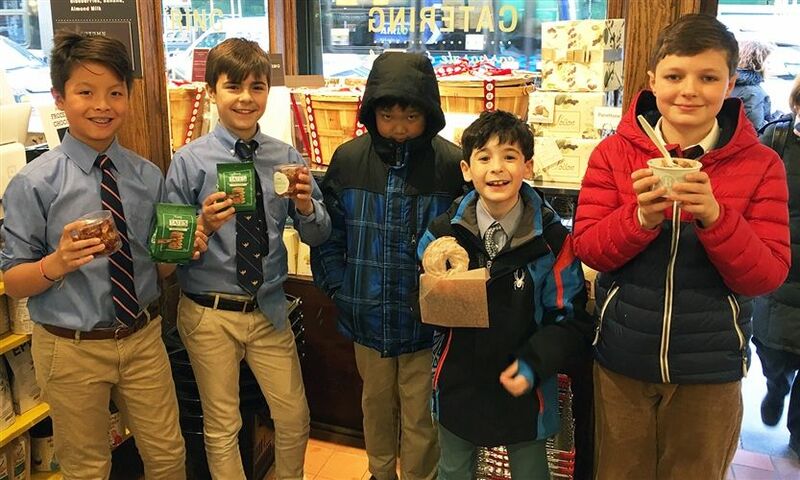 At our pizza parties last week, boys voted for their favorites.